I have been looking for a while for inline proxy that is easy to setup and manage and a co-worker suggested trying IPFire. IPFire is a Linux based hardened OS compiled from sources and takes about 15 minutes to do the basic installation. Before starting, you need to determine how many interfaces (zones) you need to setup (2 to 4); mandatory green for internal, red for Internet and you can also have blue for wireless and orange for the "demilitarized zone" (DMZ). To access the interface after the software installation, access via https://ipfire:444. The main feature I was looking for is a secure web proxy to put my web clients behind a multipurpose filtering proxy. However, I was pleasantly surprised of all the features available including cache management, URL filter, DHCP server, Snort IDS (Guardian), SquidClamAV, IPSec, OpenVPN and firewall to name a few. After the initial setup, the system is ready to use but if you want to use Snort, you will need to add the Guardian package using the package management application Pakfire. This application is easy to use to add any of the available packages, select the package(s) and the application will check and add any packages dependencies for the application to run. A list of all the Pakfire add-ons is listed here. The logging for each application is also very good and can also be setup to send the logs to a remote logger (SIEM). Obviously, if you are an business, you can purchase a IPFire hardware appliances for enterprises, large businesses and SOHO. If you are interested in an easy to use household multipurpose Security Gateway, give this one a try. 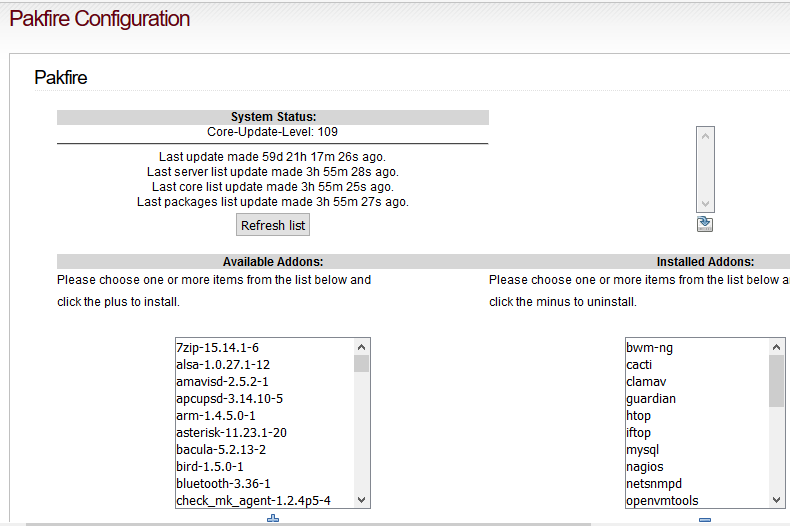 I am evaluating this as a VM on my home network. I would like to deploy this for IDS/IPS on my home network. I am already running a Sophos UTM between my Netgear switch and cable gateway router. I am not sure if I have a spare box to use as an ipfire box...is there any way I could deploy this on my home network as a virtual machine? My thought is that it would scan traffic between the Sophos UTM and Netgear switch. Can you please recommend a deployment option suitable for a home network (in addition to the Netgear home switch running DDWRT, I have a spare Microtek switch but have not configured it on the LAN). Actually, I have mine deployed as a VM but I'm not currently inline. I'm currently using it only to proxy the browsers on my network. I don't see any issues sending Sophos UTM -> IPFire -> Netgear or something similar.